Online search for real estate properties has gone mainstream in India – Sites like housing.com offer you as close an experience to the real thing with virtual tours and maps. However, after search if you decide to buy a property, you obviously will need to visit the place. However, it seems now even booking a home is going to be possible online, just like you would purchase a new mobile phone. Tata Value Homes a wholly owned subsidiary of TATA Housing Development Company Limited already have online home bookings through their website. Now, they have forged an exclusive partnership with leading Indian ecommerce store Snapdeal to offer booking of home online through their platform. Snapdeal has now created a separate category called “Real Estate” (the listings are not up as yet), where they will be listing seven new projects of Tata Value homes in 5 cities – Mumbai, Pune, Bangalore, Chennai and Ahmedabad. The partnership has been forged for 1000 apartments for prices ranging from Rs. 31 Lakh to Rs. 70 Lakh. Interested buyers will need to first register online with Snapdeal by Rs. 30,000 (non-refundable). Final bookings will open on August 28th at 10 am and only registered users will be able to make apartment purchases. As an introductory offer on Snapdeal, Tata Value Homes will offer each customer who have booked the apartment online Rs. 10,000 per month as a rent for a year after possession of the apartment unit. It does not matter whether customer choses to live there or leases it to someone else. 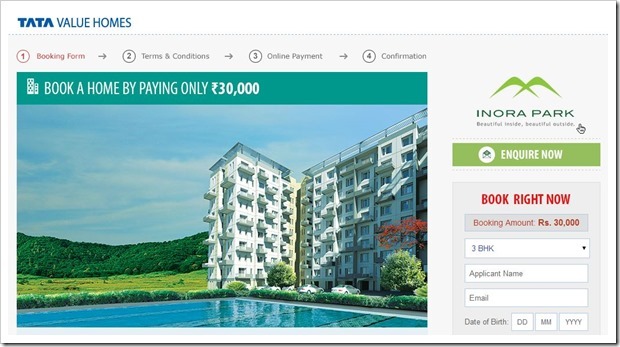 Tata Value Homes, on their site have already been offering online home bookings for some time now. So, partnership with Snapdeal is probably a channel to leverage their customers. Booking homes online may work quite well with NRI’s and investors, who basically want to invest their money in varied properties across India. For Individual investors, home purchase is the biggest purchase they do in their lives, so booking it online may not feel too attractive to them. These folks will generally visit the place and see every small thing before they make a decision. In our view, Tata has bought booking homes online for investors rather than individuals.